Specific lighting is often a symbol for holidays...illuminated trees during Christmas, fireworks during the 4th of July, and of course candle lit pumpkins during Halloween. 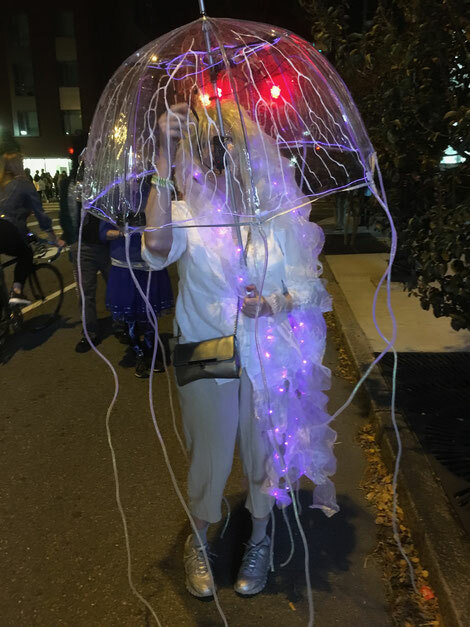 The role of lighting during Halloween has now expanded in new and innovative ways to include illuminated costumes using batteries and LEDs. These act almost as "moving sculptures" and add a lot to the richness of the holiday.